So we went to Serbia. A vacation in Serbia is not something you read about much in Conde Naste Traveler. Following the breakup of Yugoslavia, Serbia earned itself a pretty bad international reputation, sort of as the Toughest Meanest Kid on the Balkan Block. You may also klnow Serbia as the country that produced all the Hollywood action film villains of the late 1990s (Serbian actors made a cottage industry out of pretending to hunt down and torture Bruce Willis. "Would you like to die fast... or slow?....") You may remember a genocidal gasbag named Milosevic, you may remember a war or two in the Balkans, all of which is very worth remembering. But Serbia today has calmed down, considerably. They have gone back to being easy going, approachable, friendly Balkanoid folks - maybe somebody found a couple of free duffel bags of Xanax in Niš or something. If you are in the neighborhood (anywhere east of Vienna and north of Athens, say) Serbia would be well worth a visit, if only for the meat. Leskovac Pleskavica in Novi Sad. Yes, it is the size of a child's head. The baddest Balkan burger for $4.00. Serbs like meat. They like meat a lot. Particularly meat served with as little froofrah as possible: chunks of meat grilled over a fire is the cornerstone of Serb cuisine, and they are masters of it. At some point around 150,000 years ago, early man tamed fire and first grilled a bit of meat over an open flame. That was enough for the Serbs - they never seemed to bother with other techniques for applying heat to protein. There are grills - rostilj - on every street corner, and the savory smell of grilled meat bathes the nation in its hypnotic aroma. There may be a vegan or two in the country, but they seem quiet about it. Serbia is not a vegetarian paradise, although a visit to an open air market there is a trip to organic, non-genetically manipulated salad paradise. But in Serbia, vegetables know their place! Their place is next to meat! 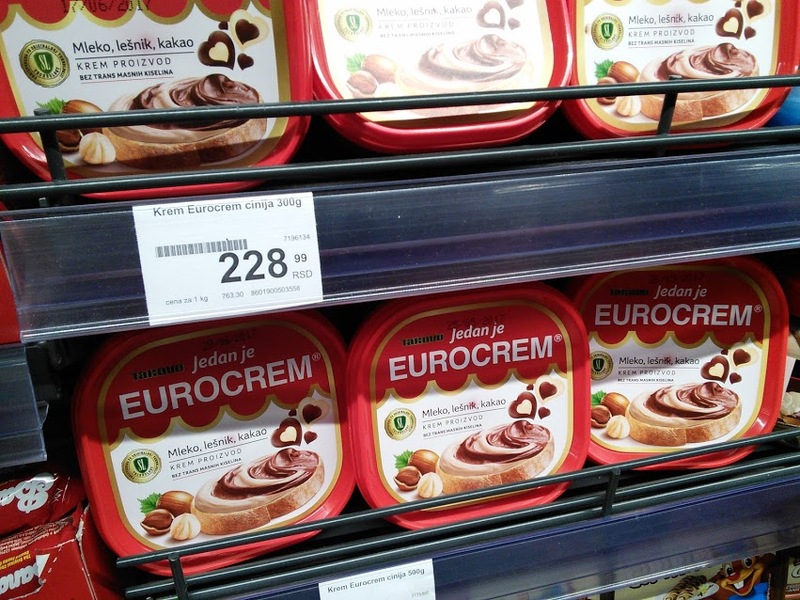 Since the Serbian macroeconomy remains a bit... isolated, undeveloped, sad, pathetic, and perhaps, totally tanked, Serbians tend to shop and eat locally, and even their supermarkets seem to be stocked with local specialities that appear no place else on earth. If you are not earning your living inside of Serbia these products will appear to be surprisingly affordable, almost surrealistically so, inspiring thoughts of extending one's tourist visa for, perhaps, a five to ten year stay. Food and drink are cheap for outsiders: significantly less so if you are local. Serbia is the last bastion of local branding: you won't see the big Global brands and chains here, which is refreshing. And most of the locally produced stuff is surprisingly quite good - at least it is unlike anything you can find outside of Serbia. It's Eurocrem, silly! Just smear it on everything! When I am south of Hungary I go for the meat, preferably cevapcici (skinless ground meat wads) or pleskavica - the Balkan equivalent of a hamburger. Unlike a hamburger, pleskavica are made from special secret recipes for the ground meat mix (usually veal, lamb, and pork in various combos) and serious techniques for its preparation, such as freezing it before kneading the meat into a pastelike consistency. Pepper and eggplat ajvar, chopped onions, and a bit of salad are all this needs to complete a full meal. And don't forget to order your meat with a dollop of kajmak, a sourish clotted cream product that combines the taste of cheese with the rich melting consistency of butter. "Hamburger" doesn't begin to reflect on the meaty, testosterone inspiring magnificence of a well constructed pleskavica nestled in a soft, spongey balkan pocket bread known as somun. And while I - and quite a lot of Serbs and other Ex-Yugos, will agree that the best cevapi are those of Bosnia, either the small Sarajevo cylinders or the square Banja Luka style, Serbia remains the master of pleskavica. And since you simply can not get a decent hamburger in Europe, we have to accept the fact that pleskavica is not only the next best thing... it may be the best thing. Pleskavica across the street from me at PolaPola. I am lucky in Budapest, because just across the street from us on Klauzal ter in the 7th district is the PolaPola, a Serbian grill house that serves, perhaps, the best cevapi and pleskavica in Budapest, and bakes their own fresh and spongey somun bread as well. and they stay open until two AM and they have a huge glass container hanging from the ceiling FULL OF SERBIAN PLUM BRANDY waiting for anyone (such as me, Frank London of the Klezmatics, Mitia Khrantsov of Sankt Petersburg Klezmer band Dobranotch, and dance ethnographer Sue Foy) to signal for a refill of our glasses. Frank London, Sue Foy, Mitia Kramtsov awaiting their slivovica at PolaPola. When leaving Novi Sad, which is about a six hour train ride from Budapest, the last thing that you notice at the station are these signs advising against unsafe use of the trains: don't climb on the roofs where the electric wires can kill you, don't jump in front of the trains... do people really need to be told these things? In Serbia... Yes.